On clear nights, many Colombians enjoy hanging out in the park before heading to a bar or club. Parque Lleras is the heart of Medellin’s Zona Rosa in the upscale Poblado neighborhood. 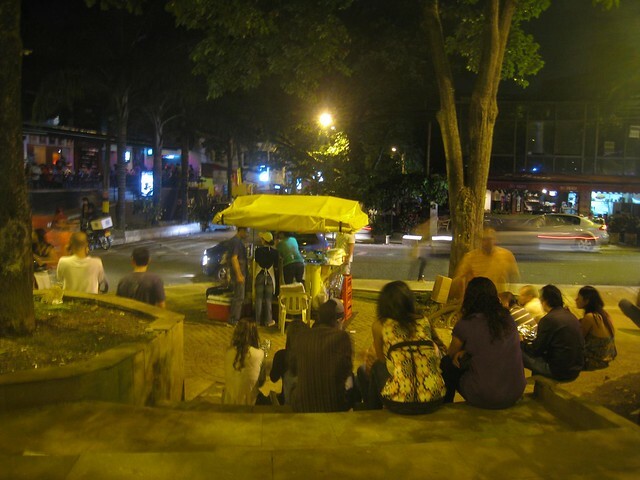 The safest and most obvious choice for nightlife in Medellin is the area surrounding Parque Lleras. Block after block is packed with bars, clubs and restaurants and the streets and park itself are filled with partiers Thursday – Saturday. This is a playground for Medellin’s upper crust. The young and beautiful, the wealthy and the hip. It is definitely the place to see and be seen, and people-watching over a maracuya-lulo mojito is a fine past-time before the urge to dance at one of the many thumping discotecas overtakes you. The best part about the Parque Lleras nightlife scene is that is very safe. One can feel comfortable drinking in the park, roaming the streets and bar-hopping ’til all hours of the night. And the density of bars and clubs mean you can probably find what you’re looking for — whether it’s 90’s American rock at Blue, electronica at Betty House or Reggaeton-crossover mostly everywhere else. 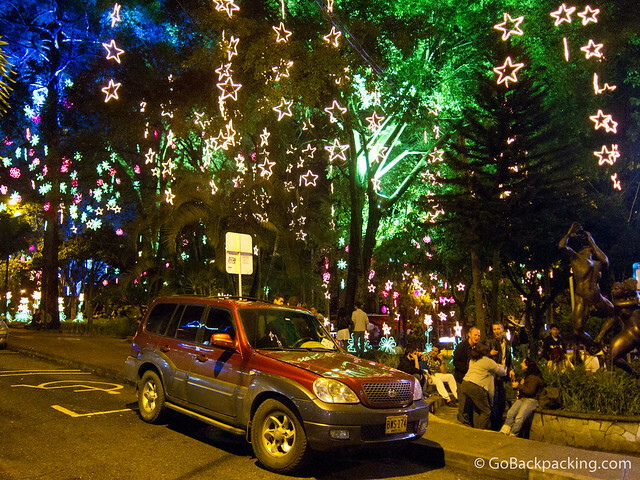 Every December, Christmas lights are strung up in the trees of Parque Lleras. The downside to the Parque Lleras scene as I see it is that it is this sterilized cookie-cutter image of Colombian nightlife and it seems like a lot of the people are more concerned with looking like they’re having fun than actually having fun. In other words, the effort the Lleras crowd puts into looking glamorous can be a little … boring. The other drag is the cost — cocktails are expensive and lots of clubs have covers. With that said, Parque Lleras is your best bet for a good time out on the town where you can feel safe wandering the tree-lined streets filled with beautiful people. There is no shortage of booze and music blasting. Don’t forget to bring I.D. as many clubs require proof of age (over 18). I will defiantly have to check out Parque Lleras next time I’m in Colombia. It sounds like a great time with a lot to do on any given night. Thank you for the wonderful write up. Been living near parque lleras for three weeks now. Great area to eat and drink. Every place seems to have happy hours for food and drink also. Amazed by the quality of it all and such cheap prices. Unfortunately have not been asked for ID yet. Parque Lleras is a dangerous place. Never go there alone, and don’t speak with people you don’t know. There are gangs hanging around there. I was druged, and then the robbed me a lot of money. How about normal , non-working girls. Do they hang out here?